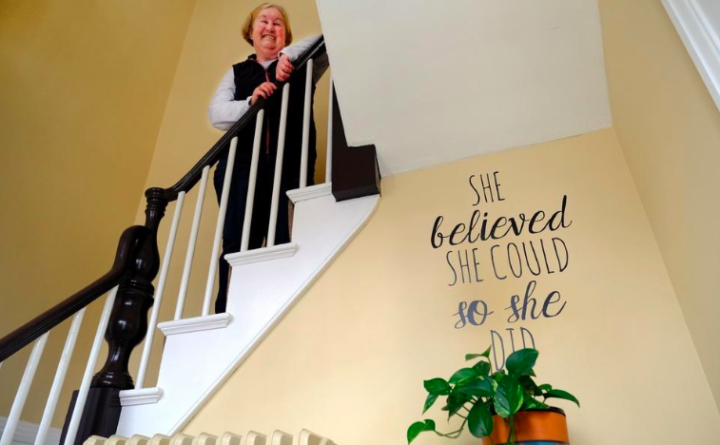 Debbie Dean stands on the stairwell near the entrance of A House for ME, a home for women with intellectual disabilities and autism in Kittery. KITTERY, Maine — Ten months after opening an independent and active home for young women with intellectual disabilities, nonprofit A House For ME still has two bedrooms to fill, and considering the lengthy wait list for housing across the state, they know there are individuals who need their services. Started by Kittery residents Dennis and Debbie Dean, who wanted a safe place for their 39-year-old daughter Dana to live and be a part of the community, A House For ME currently operates a three-bedroom home on Government Street in the Foreside. Previously the parsonage of the Second Christian Congregational United Church of Christ, built in 1860, the nonprofit completely renovated the large house, which they say now serves as a doorway to independence, responsibility and activity. While Dana has thrived in the setting since moving in last July, there are still two open spaces in the house, which is thought of as a pilot project in the state. State Rep. Beth O’Connor of Berwick recently submitted a bill to the Legislature seeking the Department of Health and Human Services start its own program modeled after A House for ME; providing housing to two to three residents in each home with the assistance of volunteers to help them become contributing members of the community. Dana works each day at Sentry Hill in York, an assisted living facility, and is a popular volunteer at Table of Plenty’s free community suppers in Kittery each Thursday. She and the home’s live-in companion, a volunteer who oversees the house and lends help when needed, as well as occupational therapy and nutrition students from the University of New Hampshire, go to Lil’s Cafe, shop at the Kittery Outlets, grocery shop, fix dinner together and get facials. “We truly believe we have the perfect solution, but it’s finding the right people,” Debbie Dean said. Because the live-in companion is only at the house after 5 p.m., and is not considered a direct care provider, any future residents will either have to work during the day, like Dana, or be part of a day program, which Debbie said presents some restrictions for who can apply to live in the home. Dennis Dean acknowledged that because they’re a new model of supported living, he understood the apprehension some parents and families may feel around seeing their intellectually disabled child move into the home. “If somebody had come to us five years ago and said, ‘Hey, we’ve got this great new idea, we want to try it,’ I don’t know if we would have done it as parents,” he said. Dennis Dean said there are currently 50 people with intellectual disabilities on the state’s housing wait list just between Kittery, Eliot, York and the Berwicks. Statewide, it’s almost 1,800, he said. In 2013, nearly 800 people were ahead of Dana on the list. A House For ME will host an informational night April 26 for interested families at the Second Christian Congregational United Church of Christ at 6:30 p.m. Dennis Dean said it’s open to any and all who have interest in exploring options for young women with intellectual disabilities. The Deans said the financial and community support since they opened the home has been overwhelming. Many businesses donated services when they were renovating the house, and they continued to be supported. They’ve also been successful in securing some grants. Dennis Dean also gave a nod to their dedicated board of directors.